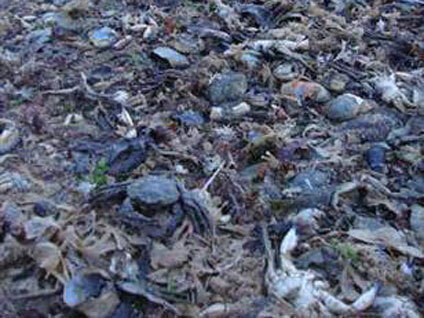 40,000 Dead Crabs Wash Ashore in U.K. Birds fell from the sky to their deaths in the Ark., La. and Sweden, dead fish are floating around in Md. and Brazil, and most recently, over 40,000 dead devil crabs have washed up along the Kent coast in the U.K. The latest in the string of animal mass mortality incidents across the globe has caused many to wonder if an animal apocalypse is on the brink. The media started paying to attention to mass mortalities after a flock of blackbirds fell from the sky in Ark., crashing into homes, cars and each other before dying. Doug Inkley, senior scientist at the National Wildlife Federation, told CBS News that blackbirds don't have very good night vision and that they were simply frightened. While the media has put a spotlight on mass animal deaths, there is nothing unusual about them. "There's been an unusual amount of attention on this type of thing which does occur quite frequently," said Inkley. "Most mass mortality events in wildlife are caused by disease, some are caused by pollution, such as the Gulf oil spill disaster and some are caused by freak accidents." Although the string of animal die-offs are unrelated, Inkley said climate change is the true cause for concern. "Some 20 to 30 percent of species in the entire world could be moved a step closer to extinction by 2050 due to climate change," said Inkley.